A diagram showing how a fuel cell works. Chances are you’ve not even thought about hydrogen powered fuel cells as part of your retreat energy strategies. For most purposes, fuel cells would indeed not be a good choice, but there’s one special scenario where they might be of relevance – as part of a way to store energy. But, before you rush off to your local fuel cell store to buy a dozen (as if such a place exists! ), you might want to read through this article and in particular, appreciate that whatever the advantages of fuel cells may be, there’s one also a disadvantage. The technology for a ’roundtrip’ transfer of energy from electricity to hydrogen and back to electricity is expensive and not very efficient (on the other hand, it is not necessary any worse than other alternatives open to you). You could be excused for stopping reading at this point, and we write the rest of this article mainly to provide a reference point you can track from. We are sure that the technologies involved will improve over time, and you can match new products with the information here to see how much closer to practical affordability things are progressing. Of course, if you do come across a relevant new improvement, please let us know so we can update the information here. We’ll explain a bit about fuel cells in this article, and look at the plus and minus issues associated with storing your surplus energy (should you be so fortunate as to have any, of course!) in hydrogen and then converting it back to electricity via fuel cells. 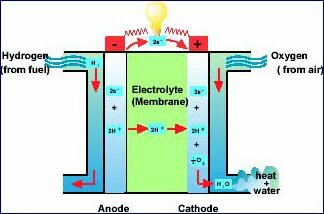 A fuel cell can be thought of as using the opposite process to that which causes the electrolysis of water. When you electrolyze water, you use electrical energy to separate the water into its component hydrogen and oxygen. When you use a fuel cell, you combine hydrogen and oxygen to create water and you get electrical energy produced as part of the process. Other materials can also be combined, but hydrogen and oxygen is the most common, particularly because this means you only need to store the hydrogen, obtaining the oxygen from the air all around us. Note that you could also run an internal combustion engine on hydrogen fuel, but this is nothing like a fuel cell. A fuel cell has no moving parts and generates little heat and almost no noise, an internal combustion engine takes chemical potential energy, converts it to heat, and then converts the heat to motion, and then converts the motion to electricity. Ecologists like fuel cells because the byproduct of running a fuel cell is simply water. No noxious/toxic nitrogen or sulfur products, and no carbon releases. What’s not to like about that (or so the ecologists ask/tell themselves). But, as with most things, there’s a lot more to fuel cell technology than simply ‘burning’ hydrogen and oxygen and getting water and electricity as a result. Fuel cell technology is both old and new. It has been around in experimental form for a long time – the first were invented in 1838. More recently, fuel cells have been used to generate power on the space station, and in experimental fuel-cell or sometimes termed ‘hydrogen powered” vehicles. Fuel cells, in miniature form, are even used in portable electronics. Not all fuel cells use hydrogen. There are other chemical processes that can also be used (if the fuel cell is designed for it of course), but we are focusing on hydrogen fuel cells here because on balance, the ’roundtrip’ to generate hydrogen, store it, then use it in a fuel cell is probably the easiest and best for prepper purposes. Although based on old technologies, fuel cells are also more in an experimental than a commercial state of being at present. This is because there are issues with cost and efficiency that currently make them impractical for any type of regular normal use, but while the efficiency levels are very low, the promise of boosting efficiency holds out an exciting hope that fuel cells may become more commercially viable in the future. Furthermore, if money is not a constraint, then the ability to store hydrogen for extended times with little loss is a huge plus. Most other energy storage systems are not as practical as hydrogen if you want to store the energy not just for a day or two but for many months. Even if fuel cells themselves become more efficient, there’s another step in the process that needs a lot of additional optimization – collecting/creating hydrogen and then distributing it to refueling points. It is important to realize that while hydrogen is the most abundant element on the planet, and oxygen is all around us, that does not mean the cost to power a fuel cell is negligible. Most of the hydrogen out there is currently ‘locked up’ in water (which is, as you doubtless already know, H2O) and extracting the hydrogen from water (or from natural gas – another rich source – CH4) – is expensive, as can also be the technologies to store and transport hydrogen. On the other hand, as long as you have hydrogen stored in a leakproof container (slightly harder than it sounds! ), it will keep forever. This is the same as propane, but quite unlike petrol or diesel (see our discussion about storing liquid fuels), and also quite unlike other energy storage methods such as batteries or accumulated reservoirs of water for hydro power. This is clearly a good thing. The relevance of hydrogen storage and fuel cells for us preppers is as another way of storing energy. If you are preparing for only a level 1 or low-grade level 2 event, maybe you’ll cover your energy needs by simply buying a generator and laying in an adequate supply of fuel for it, and possibly stick a couple of solar panels on your roof as well. That’s a fine way to proceed, and it allows you to reasonably closely match your power needs as they vary during each day and night with the supply of power from the generator. In such cases, however, you’ll not really ever find yourself in a situation with ‘too much’ power and wanting to find some good use for it. But most of us, no matter what outcomes we are preparing for, will choose to use primarily renewable energy sources (ie wind and solar) for much/most/all our energy needs. The huge problem with these energy sources is that their output varies widely, with the weather, and in an unpredictable manner. As we discuss in articles such as ‘How Much Solar Power Generating Capacity Do You Need‘ and ‘How Much Extra Emergency/Reserve Capacity Does Your Solar Power System Need‘, it is necessary to develop more powerful than necessary generating systems so that they will provide close to sufficient power, even with very little sunlight (or wind). The happy flipside of this is when the wind is blowing in its sweetspot speed zone, and the sun is shining brightly onto your solar panels in a cloudless sky. All of a sudden, your power generation is providing you with two, five, maybe even ten or twenty times the power and energy you need. There’s no such thing as ‘too much power’ of course, and there’s no problem or harm to your system if you simply choose to ignore the extra power that is coming from your generating system and ‘waste’ it. But maybe you might also look at the downside of sometimes being very short of energy, and seek a way to capture and save/store some of this spare energy to then use when your system is struggling to provide the energy you need. There are a number of ways you can do this, and the simplest is to go out and buy some more storage batteries. But maybe you feel the need to shun simple, and prefer to seek out complex solutions! Or, more seriously, maybe you want to spread your risk by having multiple technologies for every part of your retreat and its mission critical systems, and in such a case, a second method of power storage in addition to batteries might be worthy of some more investigation. It would be possible to use this extra power to store hydrogen, and then when you need to use the stored energy, run the hydrogen through a fuel cell to regain the electricity. That’s the simple theory of it, anyway. Let’s look a bit more now at how it would actually work, and what problems you could run into. Let’s think about this in three steps. The first is how to ‘get’ hydrogen. The second is how to store it. And the third is using the fuel cell(s) to convert it back to electricity. There are two possible and somewhat practical ways of getting hydrogen. The first involves the electrolysis of water, the second involves steam reforming of natural gas (ie methane); this latter method works well for large plants, but not so well for smaller domestic production. So, if you look at electrolysis, while you could build your own electrolysis plant, perhaps you’ll simply choose a turnkey unit. Ebay sells hydrogen generators, and we saw a listing for one that requires a maximum of 400W of power to generate up to 5L of hydrogen a minute. In other words, if we believe its specifications, 1kWh of power would generate 750L of hydrogen. Ebay has this unit listed for $12,000, and it is being sold by a Chinese supplier. But, be warned. Anything that talks about ‘up to’ has immediately given itself an enormous ‘loophole’ to invalidate its claim. Up to 5L a minute includes all numbers less than that, doesn’t it. We just do not believe, for an instant, this unit will consistently create 5L of hydrogen while consuming electricity at a rate of only 400W – if it was to do this, it would be unbelievably efficient, and several times more efficient than leading branded products with more credible specifications. You’ll doubtless be shocked and horrified to learn that you need to tread cautiously when trusting the word of Chinese suppliers selling products through eBay! Before we move on, let’s just point out one other thing about this unit. It only draws up to 400W of power. You are likely to have several kW of spare power capacity at good times that you want to divert and store. So you might conceivably spend $36,000 for three of the units, and that still only gives you a way to divert 1.2 kW of power. If you wanted to be able to divert 5 kW, then you’re looking at $144,000 for enough of these units, and clearly that’s no longer a sensible approach. Let’s now look at another product with more believable specifications. A Hydrogenics HyLyzer unit. These will product either 1 or 2 Nm3/hr of hydrogen – that’s basically a fancy way of saying 1000 or 2000 liters. The key part of the specifications given here is the disclosure that the unit consumes electricity at a rate of 6.7 kWh per 1000 liters of hydrogen created. So a single unit would soak up your spare power at a rate of 6.7 kW. To put that another way, each kWh of electricity creates about 150 liters of hydrogen. Units can usually be run at maximum production rate (to use up the maximum spare power) or at lower rates (if you have less spare power). Heavier duty larger capacity units (of a size probably impractical for us to consider) can be somewhat more efficient, perhaps requiring only 5 kWh per 1000 liters of hydrogen. We understand but have not been able to get confirmation from Hydrogenics that these units cost in the order of $40,000. Here are some apparently not quite so good units and their prices. The good news is that hydrogen is very light. Indeed, the weight of the hydrogen you store will be only a very small fraction of the weight of the tanks you have to store it in. You can choose from various different sizes and strengths of gas tanks. They can weigh as much as 300 lbs each (for a typical ultra high-pressure steel ‘6K’ tank with a 42.48L storage capacity) and can store hydrogen at pressures of up to 10,000 psi (700 Bar). At 700 Bar, you are storing just under 38 gm of Hydrogen per liter of tank space, at 200 Bar, you are storing about 14 gm per liter (and about 7 gm/L at 100 Bar). In addition to heavy bulky steel ‘bottles’ (sometimes with side walls an inch thick) there are more modern containers with high tensile carbon fibres wrapped around the inner bottle, allowing for smaller lighter containers with the same strength as steel. We prefer medium rather than ultra high pressures – less energy is required to compress the hydrogen to store it and there is less risk of tanks exploding and less stress on adapters and intermediate pressure regulators. On the other hand, the less the compression, the greater the number of tanks you need. A possible compromise would be tanks weighing about 150lb each and holding about 7250 liters of hydrogen. Each of these tanks has enough hydrogen for about 9 kWh of electricity, and costs in the order of $400. Depending on your perspective, that’s either a lot, or very little. To put it in perspective, a 12 kWh storage battery, that would be suitable for about 9 kWh of actual power, costs $3000. So the cost of tanks to store hydrogen is massively less than the cost of batteries, and furthermore, whereas batteries have a finite life and need ongoing trickle charging to maintain their charge, once you’ve filled your gas bottle full of hydrogen, you can pretty much forget about it for a long time into the future. And you could empty and refill it very many times before it became unreliable (even though we don’t anticipate you doing this much more than once or twice a year). A suitable compressor is likely to cost in the order of $5000. Add another thousand or two for miscellaneous piping, regulators, and other incidentals. In addition to storing compressed hydrogen, it is also possible to store it mixed in with other chemicals (metallic hydrides), or in liquid form. The former method is complicated but allows for dense storage of hydrogen, the latter method is massively more ‘costly’ in terms of energy needed to liquify and cool it. We like the simplicity of just compressing the gas. Less to go wrong, which has to be a major consideration when planning for any sort of emergency backup scenario. Talking about things going wrong, some people are unnecessarily alarmed at the thought of storing hydrogen. They have this mental image of the airship Hindenburg in flames, and that colors their perception of hydrogen as a safe fuel. In actual fact, the most spectacular part of the Hindenburg’s fire and demise was not the hydrogen burning, at all. It was the very reactive and flammable outside skin of the airship, and also the diesel fuel stored on board. Yes, the hydrogen did burn, but quickly and relatively harmlessly compared to these other two fire sources. The Hindenburg would have burned almost identically even if it was full of ‘safe’ helium (the fire is believed to have been started by lightning igniting its outside skin). Hydrogen is actually less flammable than regular petrol. Gasoline will burn when it reaches a temperature of 536°F, hydrogen requires a higher temperature of 932°F. The best thing about hydrogen is that it is very much lighter than air (about 15 times lighter). If any hydrogen ‘spills’ or leaks or otherwise escapes, it simply shoots upwards, like a cork held at the bottom of a tub of water and then released. As long as the release of hydrogen is either outdoors or in a structure with venting that allows the lighter than air hydrogen to escape to the outside atmosphere, there will be no problem. Fuel cells have a lot going for them. They are easily twice as efficient than internal combustion engines, because they directly ‘convert’ hydrogen to electricity, whereas an internal combustion engine converts hydrogen (or any other fuel) first to heat and then to mechanical energy and then from that to electrical energy (that’s three conversions instead of one, each with issues and inefficiencies). They are quiet, compact, and have no moving parts, making them potentially very reliable. Indeed, these fuel cells talk about needing maintenance only once every five years. On the other hand, there is a wide variation in cells as between ones designed for occasional/intermittent/light use, and those designed for heavy-duty ongoing use, and we sense that many fuel cells are still only one or two steps away from experimental and possibly not yet ready for a long hard life ‘in the field’. It seems that fuel cells commonly consume about 800 liters of hydrogen per kWh of power generated. Some can go down to the low/mid 700s, and we’ve seen others climb up over 1000 L/kWh. Compare that to creating 150 liters of hydrogen per kWh of power consumed, and you’ll see that you are getting little more than one sixth of the power back that you used in the first place. Furthermore, you need to allow for minor other power losses in the total process from solar cell to hydrogen to fuel cell to a/c power in your retreat. For example, these efficiency ratings are the best possible, assuming the units are running in their ‘sweet spot’ – if you reduce their loads, then their efficiency may drop off. No allowance is included for the energy cost to compress the hydrogen, for any leaks and losses during transporting the hydrogen from electrolyzer to fuel cell and storing it, nor is any allowance included for other things like energy for cooling systems, and other inputs such as electrolyte and coolant. We’re also not allowing for more energy loss when the DC power out of the fuel cell is converted to AC power. Here are some fuel cell systems and their prices. Here’s another one, slightly less efficient. So, to summarize, it seems that a hydrogen storage system will cost you in excess of $40,000 for a hydrolizer, another $20,000 for a fuel cell, and let’s say $40,000 for compressors, storage tanks, and everything else. In other words, you have about a $100,000 cost to get a reasonably sized system established. This is expensive, and it is also inefficient – you get back about 1 kWh for every five or six you use in the first place, and you’re using a system that can only use power at a rate of about 6.7kW; you’d need to add another $40,000 to your installation cost to be able to recover power at twice the rate. On the other hand, does efficiency really matter if the energy is otherwise being wasted? The 6.7kW rate is interesting, it coincidentally means that for every hour you are capturing energy at this rate, you get a net of about 1 kWh of energy for reuse in the future. Let’s say that in the summer, you have four hours of ‘bonus’ power each day for 150 days, that means you’ve managed to harvest a usable 600 kWh of energy to use during the winter. That’s actually not as insignificant or disappointing an outcome as you might at first think. You would need almost 500,000 liters of hydrogen stored in this example so as to get the 600 kWh of output (or, if you prefer, 40 kg). On the basis of tanks weighing about 150lb each and holding about 7250 liters of hydrogen, this would be a tank farm of about 70 tanks. Compare that to a comparable battery setup with a similar number of batteries – there’s probably not a huge difference in size (and, in case it matters, the batteries are heavier). The big difference is in total system cost. Whereas the hydrogen system has a high cost to get started, it has a low variable cost as you increase its storage. The battery system has a low-cost to get started, and a high variable cost for each extra battery. You’re looking at the better part of a $250,000 system to store the same amount of power in batteries as you could with a $100,000 hydrogen system. So, yes, a $100,000 investment would get you a setup that could store 600 kWh of energy. Add another $40,000 for more hydrogen generation capability, and more for additional storage as your budget would stretch – perhaps another $80,000 to have 1.2 MWh of energy that is stored over the summer and available over the winter ($180,000 for hydrogen compared to perhaps $450,000 for batteries). Now the benefits of a hydrogen system start to become very apparent. There’s another point in favor of hydrogen storage too. If you were to have an enormous 600 kWh battery storage resource, you might find it ‘costing’ you as much as 6 kWh a day, every day, in trickle charging, to keep the batteries maintained and in good condition. That’s not a problem in summer, hopefully, but in winter, that is power you can ill afford. To put that in perspective, you want your 600 kWh of power to last you for 150 days of winter, but during those 150 days, you’ll need 900 kWh of power just to maintain the batteries. That doesn’t work, does it! Batteries are the best solution for storing relatively moderate amounts of energy for relatively short periods of time – a day or two up to a week or two. But for large amounts of energy, and longer periods of time, they start to become less appropriate, as we just saw in the above example. One further comment. If we were to invest in a hydrogen system, we would definitely want to make sure we had redundancy – both plenty of spares and ideally two hydrolyzers and two fuel cells. So either buy two smaller units, or increase your investment still further by having additional larger units as part of the system. UPDATE March 2018 : Costs for battery storage have dropped, and probably now using a Li-ion bank of batteries would allow for lower trickle charging needs too. Without redoing the math, we do note that all major commercial installations for storing surplus energy seem to be moving to battery solutions rather than hydrogen solutions. Battery technology has improved substantially in the four years since this was written, and promises to continue improving, with the potential for major stunning breakthroughs at any time. On the other hand, hydrogen and fuel cell technology is more mature and is limited by inviolable physical and chemical constraints that mean there is no perceived potential for similar improvements in hydrogen technology. We suspect that hydrogen as a way of storing/banking electricity is a technology that has come and gone, never to return. If you want to store less than, say, 100 kWh of energy, and for a relatively short amount of time (say, less than a month), then probably batteries are your best choice. But for large amounts of energy storage – indeed, for almost unlimited amounts, and for long-term storage, a hydrogen based storage system comes into its own. If you’re seriously considering such a system, check the current pricing and the best models out there. Our sense is that values and capacities are slowly evolving and improving, making the appeal of these systems become greater and greater over time.